ALTERNATIVA = Wednesday night underground Romanian bands concert at Expirat Club. 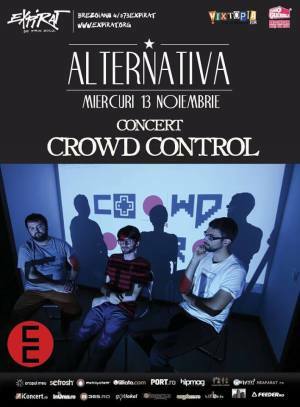 This Wednesday, November 13th, Crowd Control concert at Expirat in Bucharest. Crowd Control is a musical project from Bucharest via Rm. Valcea, offering a new and eclectic alternative to the local sonic landscape. The electro-fusion band invites with each performance in a special trip to the thin boundary between social manifesto, underground, indie, post-punk and dub. "ALTERNATIVA @ EXPIRAT" Concert in Bucharest. You can get here description, reviews, address, time and details of "ALTERNATIVA @ EXPIRAT" Concert in Bucharest. Visit Bucharest Tips for more Concert events in Bucharest!